Get 4 Mortimet Beckett games in only one download! Play Mortimer Beckett Super Pack, and enjoy 4 amazing games in one single download! Step inside the creepy mansion in Mortimer Beckett and the Secrets of Spooky Manor. Mortimer's exciting homebound journey continues in Mortimer Beckett and the Lost King. What are you waiting for? 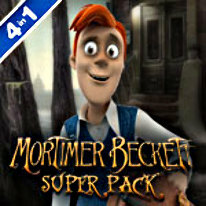 Download Mortimer Beckett Super Pack now!